As bathing suit season quickly approaches, you may be doing everything right in the gym to prepare yourself, but what happens when you still aren’t seeing results? The answer may be right in your own kitchen. To properly fuel your body for performance in the gym and to build your dream figure, you need to take a look at what goes into your body. If this is the part where your eyes glaze over and you tell yourself “I could never be that organized,” or “I’m terrible at cooking,” let me assure you meal preparation does not have to be scary. If you are truly committed to your fitness goals, you need to make nutrition a priority. All you need is a plan. Here are a few tips to help you get started. Figure out what you want to eat in the upcoming week, and how many meals you need to cook. Choose a few recipes that you would like to prepare, look through your refrigerator to see what ingredients you already have, and determine what you need to purchase. I like to read my local grocery ad for sales. I meal prep Sunday, with some additional cooking on Wednesday or Thursday, as needed. Pick one day when you have a few hours free to buy groceries and then prepare them as soon as you get home. On an average Sunday I go to the grocery store around 1:00pm and complete my meal prep by 3:30pm. This time may vary for you depending on the amount of food you are going to prepare. 1:30pm – Return from the grocery store. Turn on music, preheat oven, and heat water for tea. Remove all food from grocery bags and store anything that will not be prepared today. Cut and season fish and meat. Place chicken in the crock pot and fish/meat in the oven and set a timer. My favorite go-to recipe is shredded crock pot chicken. It requires literally no preparation, and you can season your chicken as desired for different meals. I typically top it with salsa, or use it in stir-fry’s. 2:00pm – Once the meats are cooking, I clean up their prep station and wash and chop produce. Any produce that will not be cooked right away goes into the refrigerator for later use. 2:30pm – Around this time smaller meats and fish will be done cooking. When there is room in the oven, I’ll roast sweet potatoes and veggies. I also load up my rice cooker and let it go to work. Then steam veggies, typically broccoli or asparagus, which take about 5 minutes. 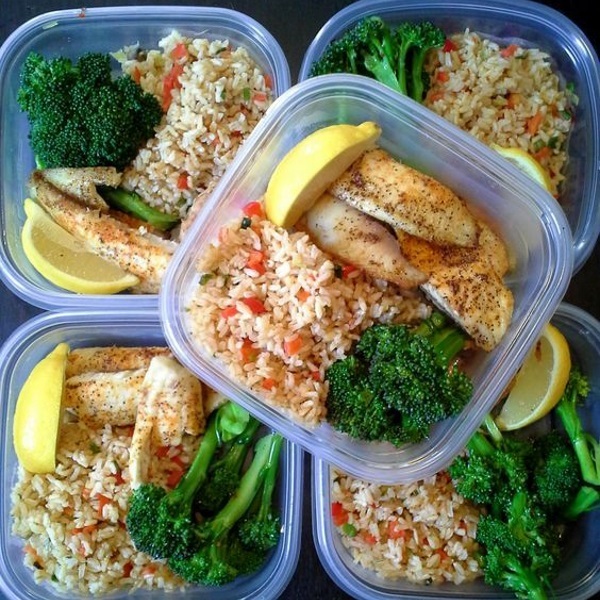 3:00pm – Put away cooked meats, rice, and steamed veggies. Clean up the kitchen. Don’t overwhelm yourself with too much at one time. Start by picking one new recipe, and gradually add in new recipes every few weeks. Alternatively, you don’t have to cook any food during your prep time if you don’t want to. Washing fruits, chopping veggies, and dividing nuts and other snacks into individual portions will be a huge time saver, and help you stay away from the vending machine when hunger strikes. Every little bit of planning and preparation will help make your week a little bit easier. Start preparing your food right when you get home from the grocery store. Throw meat and fish in the oven and slow cooker, and wash fruits and chop veggies right out of their grocery bags. This makes me more likely to grab something healthy when I want a quick snack, since the produce is ready to eat. Vegetables not being cooked right away are placed in the refrigerator to be used as needed throughout the week. Celebrate yourself for making your health a priority and have some fun while you prep. Put on your favorite music, dance around, and sing along. My favorite cooking music is Frank Sinatra radio on Pandora. I fix myself a cup of tea, put on the tunes, and get to work. If you pair your prep time with something you enjoy, you will be more likely to be consistent with it on a weekly basis. Meal prepping is only a chore if you make it feel that way. What foods and/or recipes do I want to cook? How many servings do I need to make? How many snacks do I need to prepare? What foods take the longest/shortest to cook? If you feel overwhelmed, start small by using your meal prep time to wash and cut produce, and gradually add tasks as you feel comfortable. If you start to feel stressed out, take a step back and determine what is bothering you, then change it. Consistency is important, and you will be more likely to make meal prep a habit if you are having fun.